We at Chabad pride ourselves with the fact that we are our brothers' keepers. 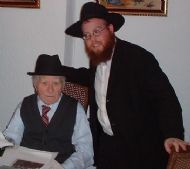 In our community there are so many Jewish home-bound seniors and sickly, and we feel it to be our duty to pay them a visit and add a smile to their faces. We are available to make visits to our local elderly and sick. If you are elderly, and or know of someone who is, please contact us and we will make an appointment for a visit. In addition, every Thursday night we deliver Kosher food from a fine Kosher deli. The delivery and visit are free, there is only a charge for the food.